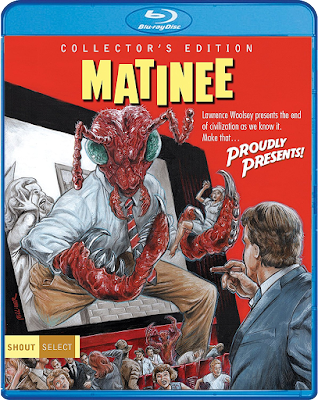 THE B-MOVIE NEWS VAULT: Shout Select's Highly Anticipated Collector's Edition Blu-ray of MATINEE Will Be Available on January 16th! 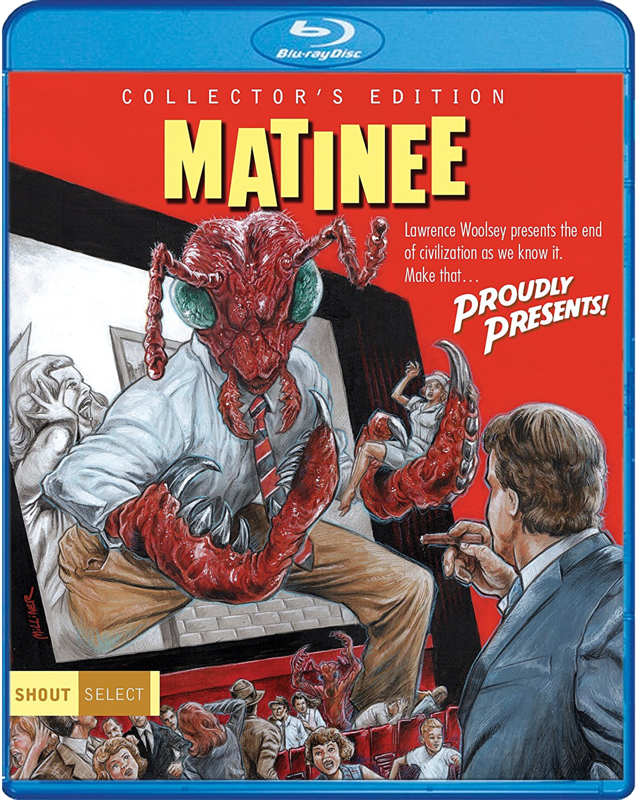 Shout Select's Highly Anticipated Collector's Edition Blu-ray of MATINEE Will Be Available on January 16th! JOE DANTE'S ODE TO WILLIAM CASTLE, AND THE ATOMIC MONSTER MOVIES OF THE 1950S, GETS A FANTASTIC BLU-RAY RELEASE FROM SHOUT SELECT! When you hear Joe Dante's name, you typically think of THE HOWLING, PIRANHA, THE EXPLORERS, THE 'BURBS, or GREMLINS! Heck, you might even recall INNERSPACE! But odds are you, like so many others, have forgotten all about his fantastic 1993 Comedy MATINEE! Taking definite inspiration from William Castle (the undisputed king of the movie gimmick), this Dante classic will put a smile on your face, and make you wish that MANT! were a real 50's b-movie! Synopsis: John Goodman is at his uproarious best as the William Castle-inspired movie promoter Lawrence Woolsey, who brings his unique brand of flashy showmanship to the unsuspecting residents of Key West, Florida. It's 1962, and fifteen-year-old fan Gene Loomis (Simone Fenton) can't wait for the arrival of Woolsey, who is in town to promote his latest offering of atomic power gone berserk, Mant! But the absurd vision of Woolsey's tale takes on a sudden urgency as the Cuban Missile Crises places the real threat of atomic horror just 90 miles off the coast. With the help of Woolsey's leading lady, Ruth (Cathy Moriarty), the master showman gives Key West a premiere they'll never forget. Anything can happen in the movies, and everything does in this hilarious tribute to a more innocent (and outrageous) time in American cinema. NEW! Master Of The Matinee – An Interview With Director Joe Dante! NEW! The Leading Lady – An Interview with Cathy Moriarty! NEW! Out Of The Bunker – An Interview With Actress Lisa Jakub! NEW! Making A Monster Theatre – An Interview With Production Designer Steven Legler! NEW! The Monster Mix – An Interview With Editor Marshall Harvey! NEW! Lights! Camera! Reunion! – An Interview With Director Of Photography John Hora! Paranoia In Ant Vision – Joe Dante Discusses The Making Of The Film. MANT! – The Full Length Version Of The Film With Introduction By Joe Dante! WOW! That is a lot of supplemental material on this release - I am so stoked for this disc! MATINEE comes to Collector's Edition Blu-ray from Shout Select on Tuesday, January 16th! This release currently costs anywhere from $22 - $28, and can be ordered now from AMAZON, BULLMOOSE, DIABOLIK DVD, or directly from SHOUT! FACTORY (which will net you a cool 18 x 24 poster featuring Shout Select's new artwork)!